Are you looking for a versatile theme for spring? 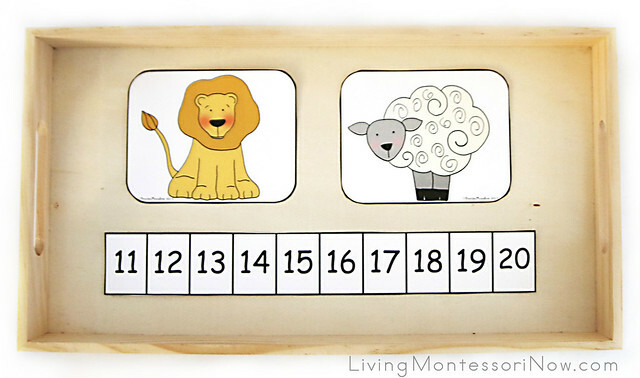 A lamb theme can be used for concepts from “Mary Had a Little Lamb” to “In like a lion, out like a lamb” to farm animals to the Good Shepherd. 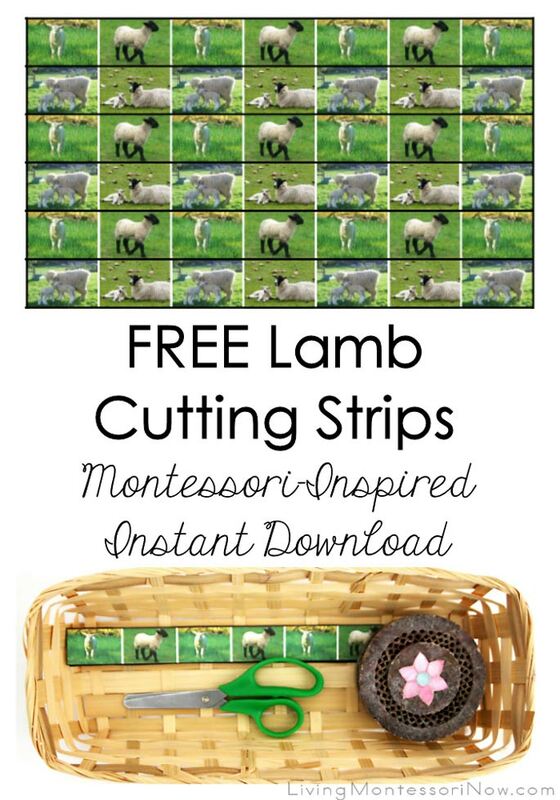 Today, I’m sharing links to free printables for a variety of lamb themes along with with hands-on activity ideas for /l/ as in lamb, “Mary Had a Little Lamb,” and March’s “In like a lion, out like a lamb.” I’m also sharing our latest subscriber freebie and a special instant download from The Montessori Company! 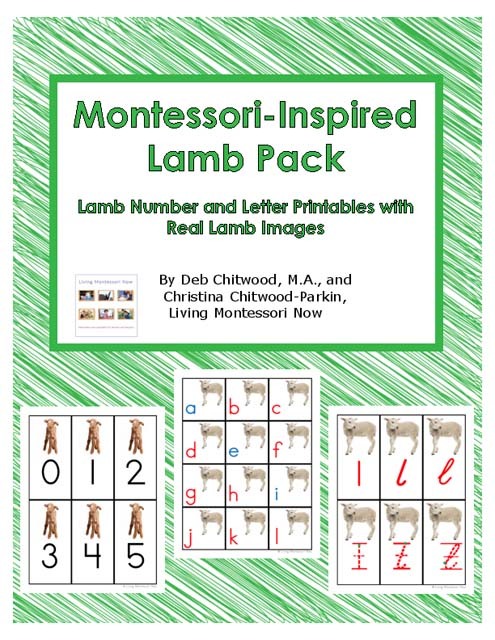 The links are for free lamb printables for preschoolers through 1st graders (although many of the lamb printables focus more on preschoolers). To keep my list manageable, I don’t share coloring pages unless a page has a specific educational purpose related to lambs. 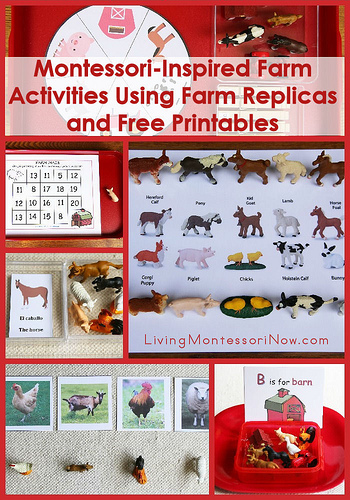 At PreK + K Sharing, I tell how I used the printables to prepare Montessori-inspired lamb activities. I also have links to other posts with additional ideas and presentations. The books on my shelves include Mary Had a Little Lamb with illustrations by Tomie dePaola (see information below), Seasons on the Farm (another book from when my children were little), and Animals Born Alive and Well (another good book from my children’s childhood). Note: It now has a different illustration on the cover. 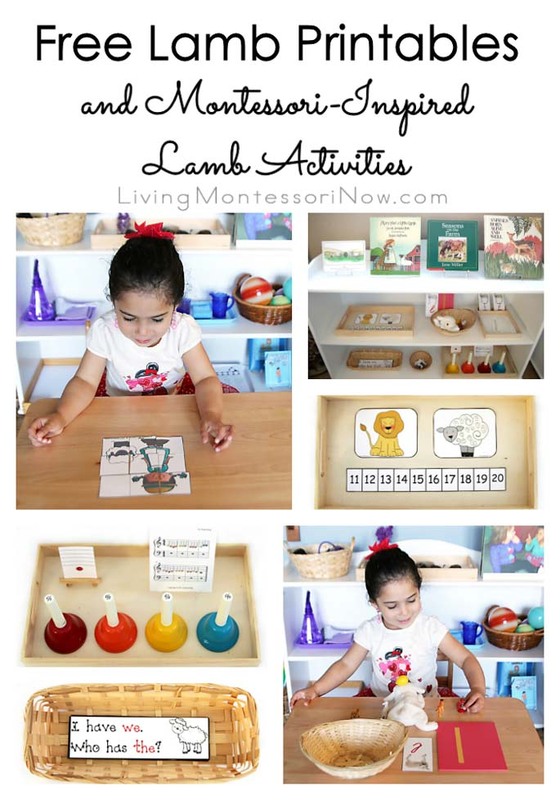 You could mix your lamb-themed activities among your shelves according to curriculum area. Or you could have a special lamb area something like the one pictured. This has a mixture of skill levels. 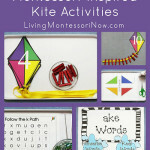 If you’re a homeschooler, just choose the activities that work for your child’s interests and ability levels. If you don’t have room for all the activities you’d like to do, just rotate them. 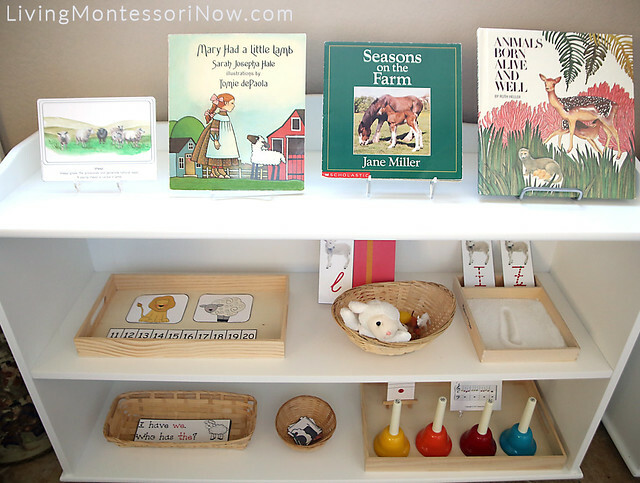 I was happy to receive a lovely hand-painted sheep culture card from The Montessori Company. 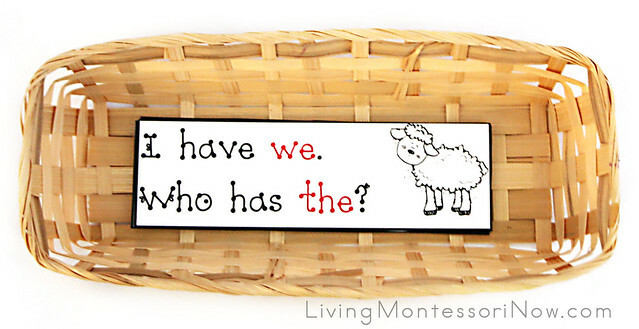 You can use it on your shelves to introduce a sheep or lamb theme. 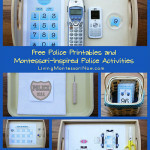 I’m hosting the free printable as an instant download at Living Montessori Now. You can always access the free sheep culture card here. This classic Mary Had a Little Lamb with illustrations by Tomie dePaola was a well-loved book from when my now-adult children were little. I’ve always enjoyed books illustrated by Tomie dePaola. Fortunately, many of his books are still in print. 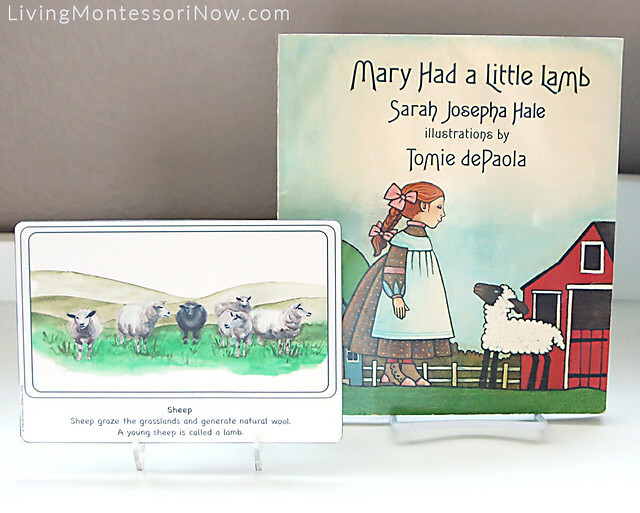 Unfortunately, Mary Had a Little Lamb illustrated by Tomie dePaola is out of print, although there are many fun book versions of Mary Had a Little Lamb that are still available. 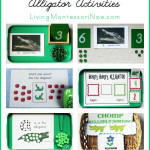 For this activity, I simply used a Montessori Services basket and the puzzle pieces. For a younger child, you could copy the page twice and have one copy (not cut apart) on the tray to help the child assemble the puzzle. 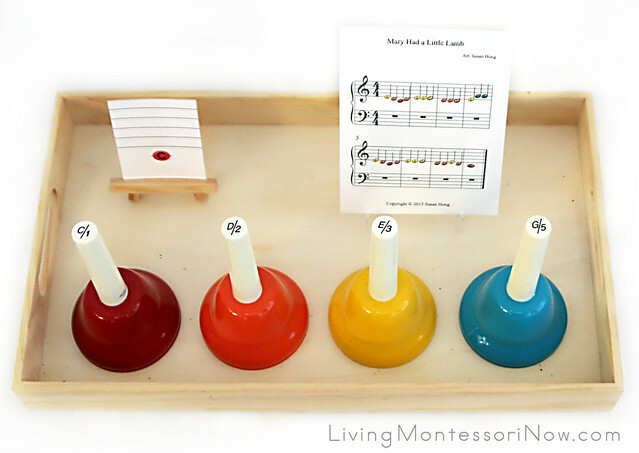 For this activity, I used a multicraft tray, small tabletop easels with the printables, and the C, D, E, and G of the preschool handbell set. Some of the objects are ones I had at home (such as Safari Ltd. TOOB objects and a miniature lamb from a Nativity set), although many are from Montessori Services (they have individual phonetic objects or a whole set available). This activity was super-easy to prepare. I used a multicraft tray and the pieces from the printable. You’ll find directions for playing the game in the printable. You can have your number line from 1-10, 1-20, or 1-30. Mine is folded so you can’t see the entire number line in the photo, but it’s for 1-20. 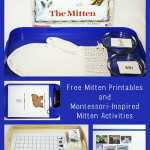 For this activity, I used a basket I had and the printable. 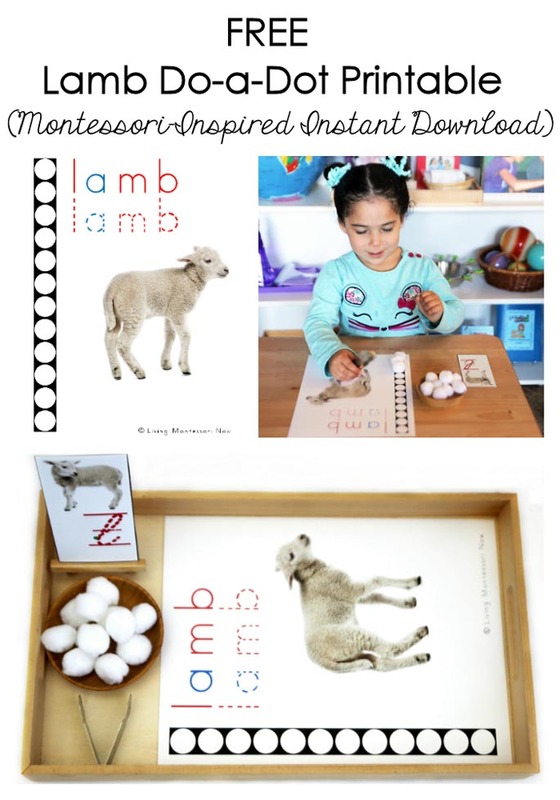 Please join me at PreK + K Sharing for ideas on how to use the free printables to create Montessori-inspired lamb activities: Montessori-Inspired Lamb Activities Using Free Printables. 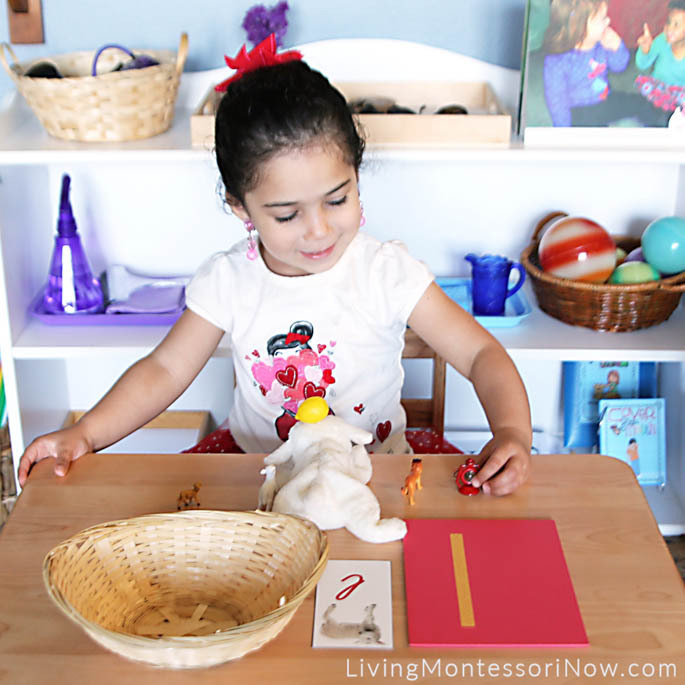 If this is your first time visiting Living Montessori Now, welcome! 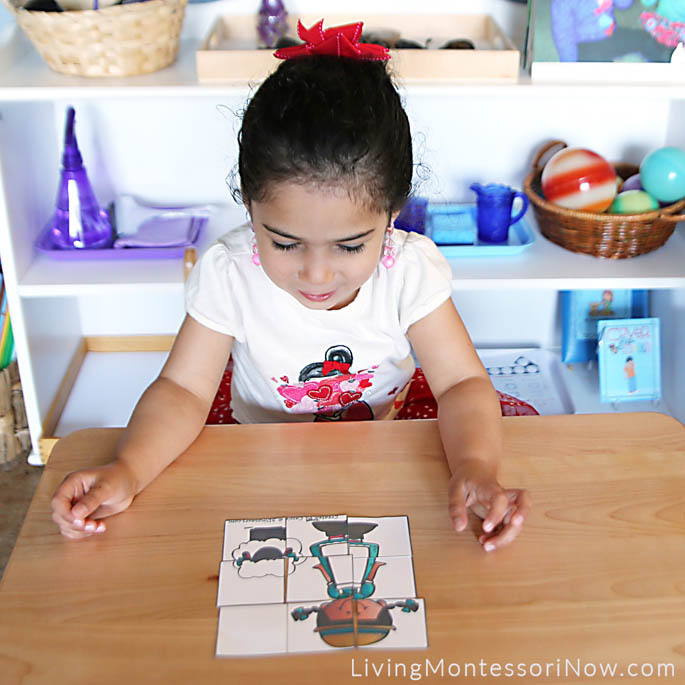 If you haven’t already, please join us on our Living Montessori Now Facebook page where you’ll find a Free Printable of the Day and lots of inspiration and ideas for parenting and teaching! 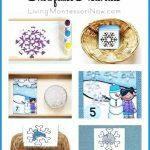 And please follow me on Pinterest (lots of Montessori-, holiday-, and theme-related boards), Twitter (blog posts by me and others along with the Parent/Teacher Daily and other interesting information), and Google+ (post updates). You can find me on bloglovin’, Instagram, and YouTube now, too. And don’t forget one of the best ways to follow me by signing up for my weekly newsletter in the right sidebar. You’ll get two awesome freebies in the process and a password each month for exclusive subscriber freebies! 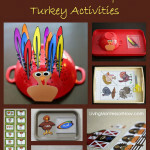 May be linked to Practical Mondays Link Up, Hip Homeschool Hop, A Little Bird Told Me Linky Party, Link-ups at Squishable Baby, Preschool Corner, Sharing Saturday, Tot School Gathering Place.